282 pages | 23 B/W Illus. The History of Migration in Europe belies several myths by arguing, for example, that immobility has not been the "normal" condition of people before the modern era. Migration (far from being an income-maximizing choice taken by lone individuals) is often a household strategy, and local wages benefit from migration. This book shows how ssuccesses arise when governments liberalize and accompany the international movements of people with appropriate legislation, while failures take place when the legislation enacted is insufficient, belated or ill shaped. Part I of this book addresses mainly methodological issues. Past and present migration is basically defined as a cross-cultural movement; cultural boundaries need prolonged residence and active integrationist policies to allow cross-fertilization of cultures among migrants and non-migrants. Part II collects chapters that examine the role of public bodies with reference to migratory movements, depicting a series of successes and failures in the migration policies through examples drawn from the European Union or single countries. Part III deals with challenges immigrants face once they have settled in their new countries: Do immigrants seek "integration" in their host culture? Through which channels is such integration achieved, and what roles are played by citizenship and political participation? What is the "identity" of migrants and their children born in the host countries? This text's originality stems from the fact that it explains the complex nature of migratory movements by incorporating a variety of perspectives and using a multi-disciplinary approach, including economic, political and sociological contributions. "[…] the book merits praise, notably for taking on the extensive task of delineating the development of European migration policy from its informal roots at the national level through both initially unsuccessful and subsequently binding supranational coordination. The historical survey remains remarkably succinct and balances its attention between national and international policymaking. Appropriately, the primary sources reflect deep archival research at both levels, and Comte must be commended for collating sources from across multiple languages. 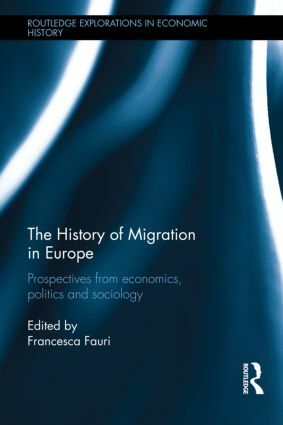 Particularly for social scientists that often synthesise the primary research of others, this book offers a rich body of information and analysis uniting national politics and economics within a dynamic framework that traces the emergence of European governance of migration." Francesca Fauri is Assistant Professor and Jean Monnet Chair in Economic and Migration History at the University of Bologna, Italy. Her research centres on Italian and European economic history, with a specific interest in the economic causes and impact of migration movements. In 2013 she won a Basic Research University Funding award to broaden her studies to the use of remittances and the history of immigrant business in Europe. She has co-edited Novel Outlooks on the Marshall Plan (Lang, 2011).